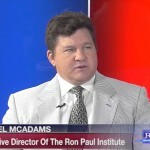 Daniel McAdams: U.S. Foreign Policy Hurting US Companies Abroad - Wall St. for Main St.Wall St. for Main St.
Jason Burack of Wall St for Main St interviewed the Executive Director of the Ron Paul Institute of Peace and Prosperity http://www.ronpaulinstitute.org/, Daniel McAdams. McAdams served as the foreign affairs, civil liberties, and defense policy advisor to U.S. Congressman Ron Paul, MD (R-Texas) from 2001 until Dr. Paul’s retirement at the end of 2012. From 1993-1999 he worked as a journalist based in Budapest, Hungary, and traveled through the former communist bloc as a human rights monitor and election observer. During this 30+ minute interview, Jason asks Daniel about why would the US declare economic war against Putin and Russia? Jason and Daniel have a very interesting discussion about the blind ideology in DC, the petro dollar and why the US’ foreign policy doesn’t always seem to make sense. Daniel says the US’ foreign policy is hurting the ability of US companies to do business in other countries.